A Russian-built Soyuz/Fregat rocket soared into the skies over the Guiana Space Center on Friday with the fourth set of O3b broadband satellites, joining twelve constellation craft launched in recent years to connect those parts of the world where Internet access is not readily available through conventional means. 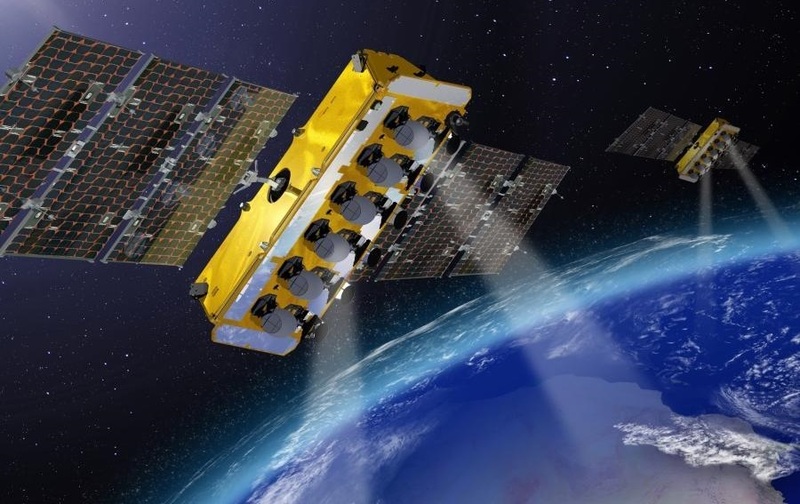 The O3b quadruplets launched on Friday will provide expansion services and extend the operation of the constellation into the mid-2020s when fleet operator SES plans to have the next evolutionary step of the system ready to deliver even greater capacity on a global scale. 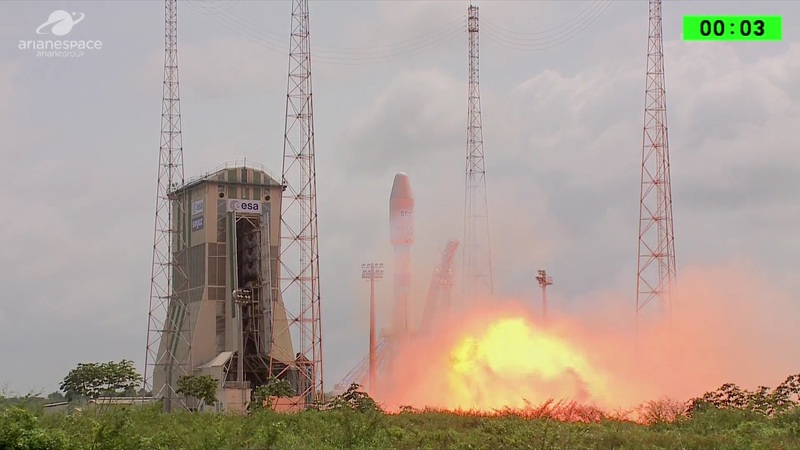 The ‘Europeanized’ Soyuz rocket – returning to French Guiana after a break of nearly ten months – lifted off from the edge of the Amazon jungle at 17:10 UTC, racing into mostly clear skies for a fast trip across the Atlantic Ocean on an equator-hugging trajectory. 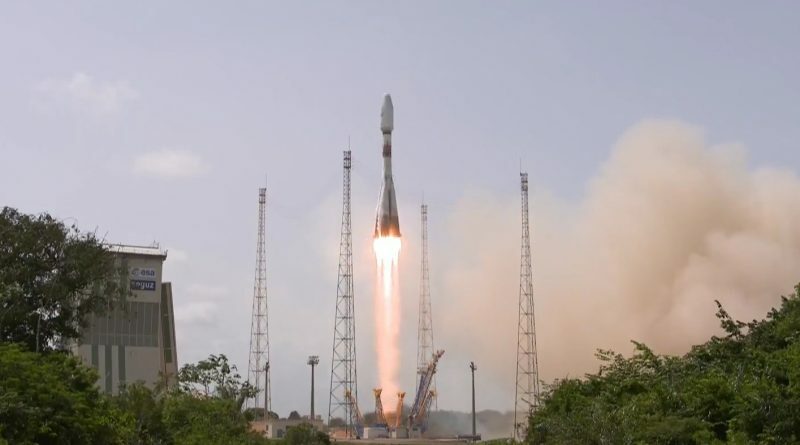 Soyuz provided a flawless ride and delivered the Fregat onto a sub-orbital arc from where it was up to the upper stage to dispatch the 700-Kilogram satellites into their desired orbit nearly 8,000 Kilometers in altitude right above the equator. Fregat first injected the stack into a preliminary orbit before firing a second time for a boost into an elliptical transfer orbit and a two-hour coast phase that took the vehicle halfway around the world for the critical circularization maneuver and pairwise separation of the O3b satellites. 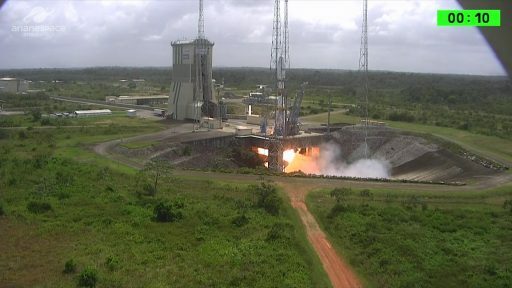 Arianespace confirmed that all satellites had been deployed into their target orbits and satellite manufacturer Thales Alenia Space reported all four were in communications with ground stations after a seemingly flawless Soyuz/Fregat mission – putting the checkmark behind the first of as many as four Soyuz launches from French Guiana this year. O3b Networks was founded back in 2007 in an effort to connect the “Other 3 billion” – referring to the world’s population without access to the Internet, particularly in developing countries and remote island states. 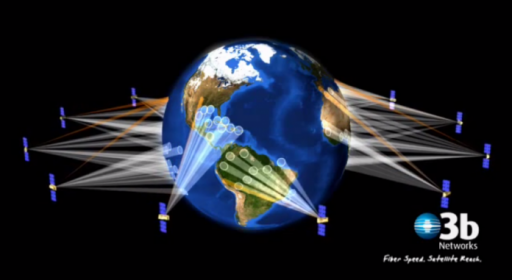 The concept developed by the company was a constellation of satellites in equatorial Medium Earth Orbit – allowing a large coverage area around the equator to be served with a manageable number of satellites while also cutting the two-way signal travel time by placing the satellites at only 25% the distance of their counterparts parked in Geostationary Orbit. 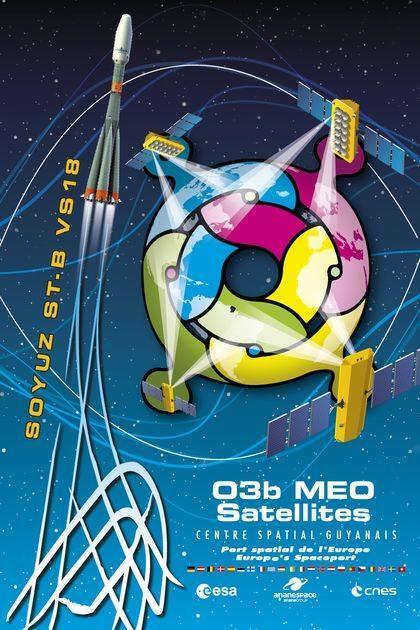 The first set of four O3b satellites was lifted into orbit in 2013, but shortly after launch it became clear that they suffered from a problem with their transponders, causing a degradation of timing signals needed for the downlink of data. Corrective measures were put in place and 2014 saw two O3b quadruplet launches to bring the constellation to twelve members; however, only nine remain in active service after three of the first batch were demoted to a stand-by position due to their timing issues. With the initial constellation in operation, O3b attracted a number of commercial customers from across the globe, including network providers on island states and other remote nations, commercial business through cruise ship operators and government contracts through the U.S. Department of Defence. SES acquired O3b as a wholly owned subsidiary in 2016 after the start-up’s business model had proved itself. 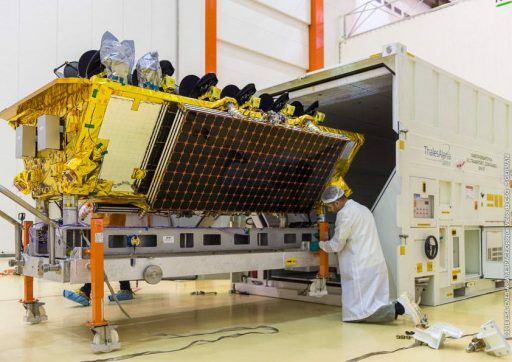 The four satellites launched on Friday were part of an eight-satellite expansion order placed to Thales Alenia Space in 2015 to provide additional capacity for the constellation and extend services into the mid-2020s via the satellites’ ten-year service lives. This batch of O3b satellites features some improvements in performance like higher throughput and processing speed, but is seamlessly compatible with the first generation of satellites already in orbit. Each O3b satellite weighs 700 Kilograms at launch, including 141kg of maneuvering propellant, and hosts twelve steerable Ka-Band antenna assemblies on its Earth-facing deck – delivering ten customer beams and two gateway beams to connect remote terminals to terrestrial network gateways or provide point-to-point trunking services. Operating in the 4.3 GHz frequency band, each O3b satellite offers a data throughput in excess of 12 Gbit/s to create fiber-like trunking services and data backhaul directly to 3G and WiMAX cell towers. The launch of the final four O3b satellites currently on order is planned in the first half of next year before constellation operator SES expects to upgrade to the follow-on system called O3b mPower, set to add a series of high-throughput satellites to the constellation starting in 2021. mPower will expand the constellation to global coverage, switch manufacturers to Boeing and leverage state of the art technology to enable the baseline seven-satellite constellation to deliver nearly 30,000 communications spot beams. Preparations for the 18th Soyuz launch from French Guiana, the 1,885th overall, kicked into high gear last Friday when the assembled Soyuz rocket was moved from its MIK integration hall to the ELS launch pad where it took its vertical launch position. The encapsulated payload stack was hoisted atop the rocket on Tuesday after the launch was pushed by three days to facilitate additional checks as part of the resumption of missions from the CSG after the anomalous Ariane 5 VA241 flight of January 25. A launch rehearsal was run on Wednesday and the Launch Readiness Review green-lighted the mission on Thursday, allowing Soyuz to enter an eight-hour countdown operation. Four hours before the day’s planned T-0, Soyuz began filling up on rocket-grade Kerosene followed by loading the vehicle with -183°C Liquid Oxygen around the L-3-hour mark. Soyuz also received Nitrogen and Helium to act as pressurization gas on the boost stages and Block I upper stage, respectively, and technicians pumped highly reactive Hydrogen Peroxide into the boosters and core stage to drive their engine pumps. Towering 46 meters above the ELS launch pad, Soyuz was revealed at the one-hour mark when the protective Service Gantry retracted to clear the way for final preparations. Countdown operations had to be halted at T-11 minutes as Launch Controllers elected to defer the day’s T-0 time to the second available instantaneous launch slot to provide time for an area of calmer upper level winds to move over the launch site near the town of Sinnamary. As computers assumed full control of the countdown after a 33-minute delay, Soyuz pressurized its tanks and purged its engines before the first of two umbilical towers retracted from the rocket at the moment Soyuz was handed control of the final countdown steps. The venerable booster soared to life at T-20 seconds when pumps began driving and igniters fired up on the four liquid-fueled boosters and core stage – soaring to an intermediate thrust level before ramping up to a collective launch thrust of over 420 metric ton-force to overcome counterweights and lift the vehicle off the ground. 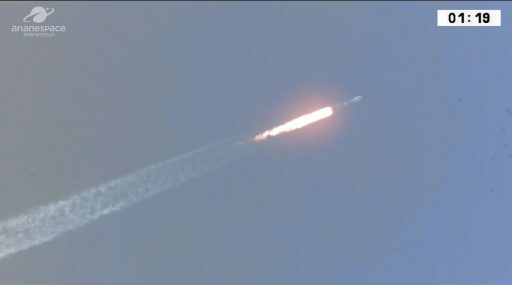 Soyuz blasted off at precisely 17:10:06 UTC and rose vertically for less than fifteen seconds before starting its pre-programmed pitch and roll maneuvers to begin flying straight to the east on an equator-hugging trajectory similar to the initial flight path of Ariane 5 missions to Geotransfer Orbit. Burning propellant at a rate of 1,600 Kilograms per second, Soyuz reached the speed of sound within one minute of liftoff and passed Maximum Aerodynamic Pressure 75 seconds into the mission as it cut through the dense layers of the atmosphere. 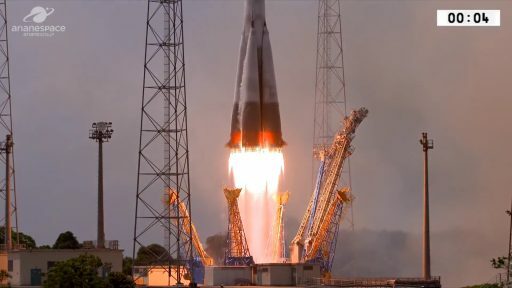 Soyuz shed its four boosters one minute and 58 seconds into the flight after each burned nearly 40 metric tons of propellant to help push the Soyuz to a speed of 1.65 Kilometers per second. Dropping the boosters into the Atlantic, Soyuz headed on powered by the four-chamber RD-108A engine alone, generating over 100 tf of thrust as the vehicle escaped the dense atmosphere. 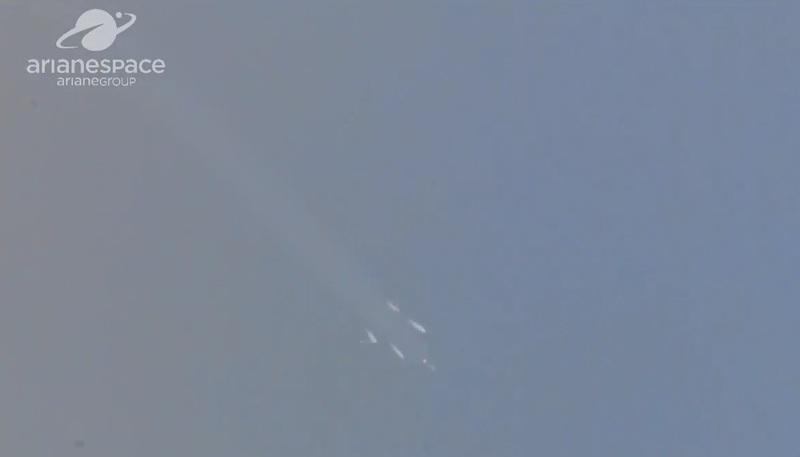 Three minutes and 55 seconds into the mission, Soyuz passed 120 Kilometers in altitude and separated its two fairing halves to lose no-longer-needed weight on its way into orbit. Block A, the trusted core stage, raised the vehicle’s speed to 3.75 Kilometers per second before the 27.8-meter long booster separated from the Block I upper stage in the typical hot staging sequence four minutes and 47 seconds into the flight. Firing up its closed-cycle, 30-metric-ton-force RD-0124 engine, the modified Block I stage was tasked with a burn of four and a half minutes to lift the Orbital Unit onto a sub-orbital arc of -1,186 by 194 Kilometers. 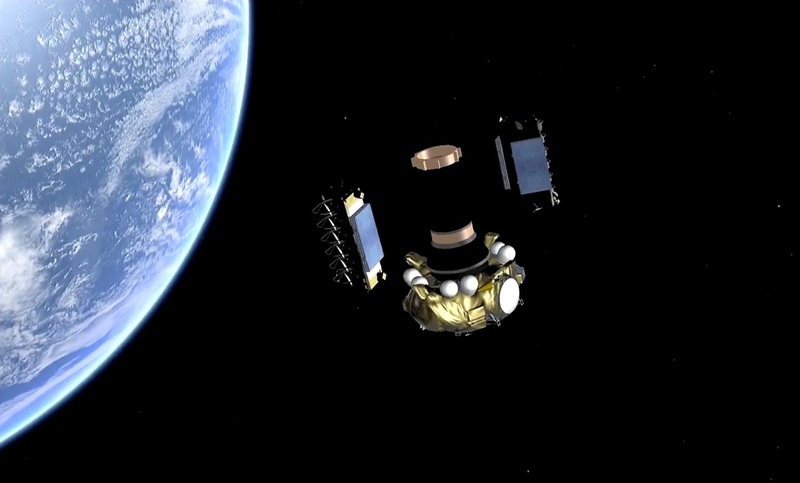 Separation of the Fregat upper stage was confirmed at T+9 minutes and 23 seconds, being sent off on a fairly complex four-burn mission to deliver its passengers to orbit. 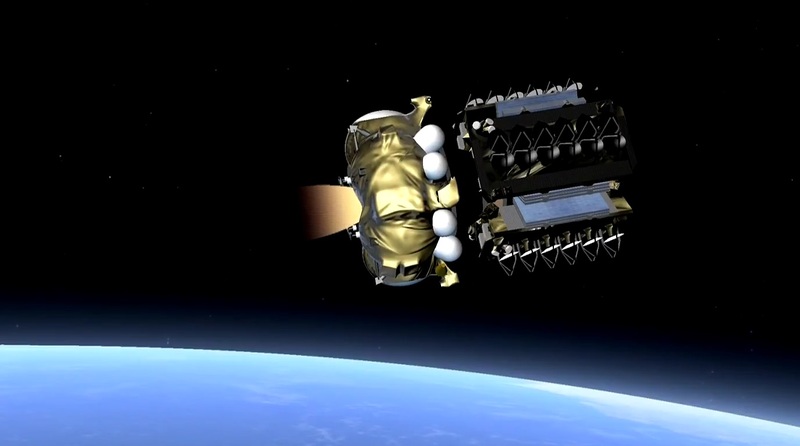 Flying in its MT configuration with extended tanks, Fregat was loaded with 7,100 Kilograms of self-igniting propellant for consumption by its S5.92 engine to lift a total payload upmass of 3,198 Kilograms into Medium Earth Orbit. Its first task on Friday was transitioning the stack from a sub-orbital path into a stable Parking Orbit, firing up its 2,000kgf main engine on a four-minute burn one minute after separation from Soyuz, targeting a 160 by 205-Kilometer orbit, inclined 5.16 degrees. Reaching orbit, Fregat only coasted for eight and a half minutes before re-starting its main engine on the mission’s longest burn of eight and a half minutes to boost the stack into an elliptical transfer orbit of 190 by 7,869 Kilometers, 3.88° – reaching its peak over the equator on the opposite side of the planet. Fregat performed as advertised and transitioned into a long coast phase of one hour and 22 minutes, designed to allow the stack to climb up to apogee for the circularization. Having traveled halfway across the planet, Fregat fired up again one hour and 52 minutes into the flight on a burn of just over 5 minutes, tasked with circularizing the orbit at 7,830 Kilometers and reducing its inclination to 0.04 degrees. The first two O3b satellites, FM14 & FM15, departed their cylindrical adapter at T+2 hours and one minute, being sent off in opposite directions to avoid re-contact. Separation of the remaining two occurred 23 minutes later after Fregat conducted a 17-second boost with its settling thrusters to create a drift rate between the two pairs and ease the process of phasing them into the operational constellation orbiting 8,063 Kilometers above the equator. 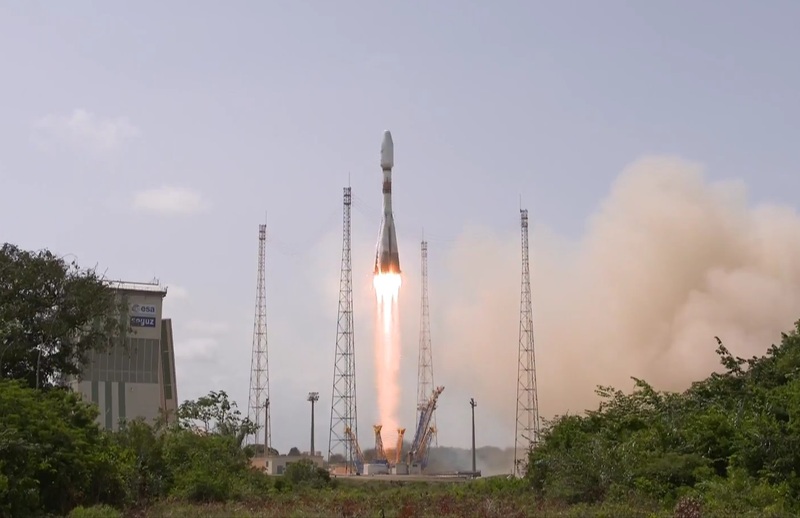 Arianespace declared mission success after tracking data showed a nominal orbit was achieved and Thales Alenia confirmed all four satellites had checked in with ground stations in good health – ready to enter a multi-week commissioning phase before entering the active constellation. 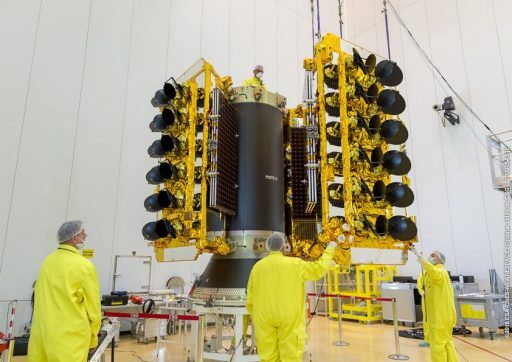 For Arianespace, the next mission is right around the corner as Ariane 5 aims to return to flight on March 21st with the Superbird-8 and HYLAS-4 communications satellites.